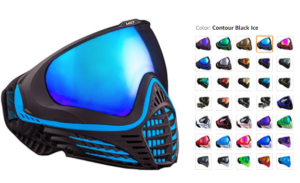 Buy the Insanely Customizable Virtue VIO Ascend Contour Paintball Mask from Amazon NOW! First of all, there seems to be a lot of confusion about the difference between Virtue VIO Ascend and Virtue VIO Contour and Virtue VIO XS. They are all the same mask, with a different fit. The Ascend is a looser fit while the Contour and XS are a more snug fit. The Contour is a low profile mask while the Extend version provides you with increased coverage. If you have a regular sized head, go for the Contour or XS. If you have a large sized head, go for the Ascend! Now, let’s get down to the Virtue VIO Ascend Contour mask review. 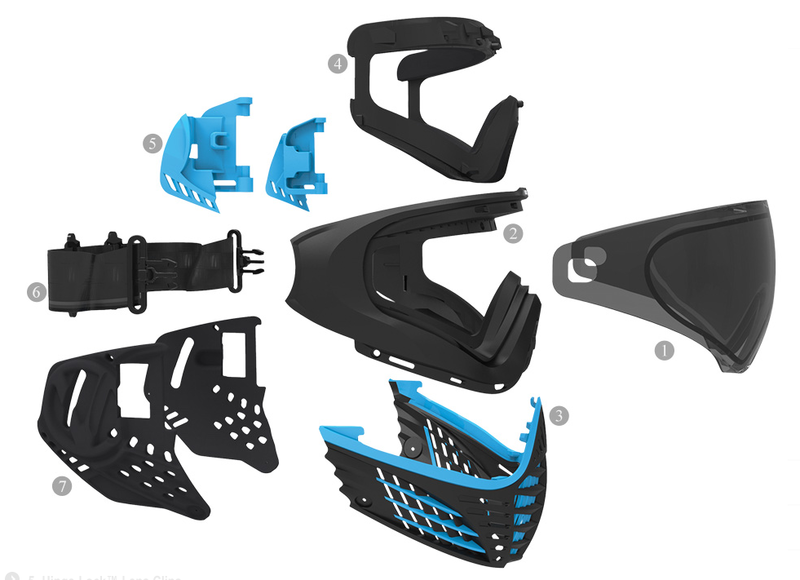 If we were to sum up the Virtue VIO Ascend Contour paintball mask, we will just call it a Dye i4, but with enhanced customization options. Oh, we will also say that the Virtue VIO Ascend has better breathability than the Dye i4, heck, even the Dye i5. While the Dye i5 and i4 have very similar venting, you will notice that the Virtue VIO has extra venting below your cheeks. This seems to make all the difference when it comes to breathability, making this the best breathable mask in all of paintball. The venting is not just to keep you cool. It will also ensure that anything you say and hear is completely non-distorted. 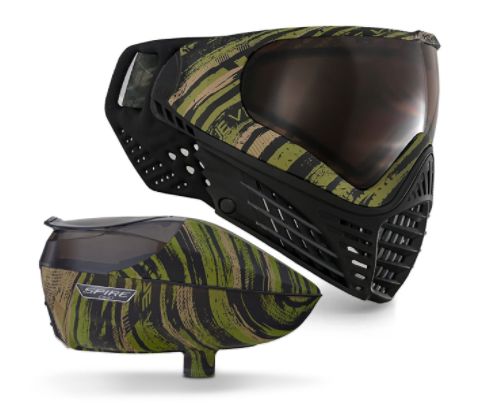 If you haven’t used the Virtue VIO Ascend mask before, you will immediately notice how incoming sounds don’t have that muffled echo that is provided by pretty much every other paintball mask out there, at least to a certain extent. You will also surely hear your friends say that you sound a lot clearer as well, as the audio you put out goes out unrestricted. This is also easily one of the best looking masks out there. Sure, the Dye i5 and Dye i4 look pretty similar and fancy. But, they don’t give you the same customization options that the Virtue Contour mask gives you. Look through most of the VIO Contour mask review posts online and you will see that people are mostly in love with this mask simply because it looks like amazing on them. 16 lenses, 18 straps and 18 visors to choose from means that you can pull off thousands of combinations to derive a look that exactly matches your need, no matter how specific or particular it may be! We particularly like the mask+hopper combo with the same design, like shown above. The above picture shows you a Contour Graphic Jungle + Spire 260 hopper with the same insanely cool graphics. With your paintball mask almost always lined up with your hopper, you are going to get a pretty good camouflage effect as well, when playing Woodsball for example. The Virtue Vio Contour mask + hopper combo is also available in a Contour graphic storm design, that features a black and white zebra pattern design. The Virtue VIO is a perfect combination of performance, durability, comfort and affordability. Hinge lock. Change your lens in 20 seconds or even less! The eye foam is removable and a new foam can be clipped into place. The foam is washable which means that you can regularly wash it to extend life and then eventually swap it out for a new one after wear and tear takes its toll. Removing the lens with the trademarked hinge lock is a super simple process. You just have to unplug the strap that connects to the goggle. This unlocks the hinge. Then, all you have to do is rotate the hinge lock inwards and your lens comes loose. Do the reverse after you have put in a new lens and you are good to go in seconds. Rotating the hinge lock does require some digit strength. If you don’t have, have a small tool handy to make it a lot easier for you. If you are buying this mask, we highly recommend that you pick up at least one smoke lens, one high contrast lens and one advanced chromatic lens to use them all on a rotation basis, depending on weather and light conditions. When you purchase this mask, you receive a 1 year warranty on it. The warranty will cover the frame and the mask. Included with the purchase of the Vio Contour is a padded chin strap, microfiber bags for both the goggles and the lenses and also a user manual with instructions on how to change the lens with the hinge lock system. Ear protection is excellent with this mask and VIO have given you the option to replace your ear pads with high density soft foam pads that come in a variety of patterns. Need a mask that looks like a million bucks, giving you the power to customize your look? Need it to have amazing breathability and anti-fog properties? Look no further than the Virtue VIO Ascend Contour. Buy it on Amazon here.